The deeper and deeper I get into content and creating, the less patience I have for things I used to love. Bear with me, this will probably resonate with many of you. I still love checking out new tools, apps, plugins, etc., but it’s not as fun as it used to be. I have my morning routine while I’m having my coffee ( a few sites I like to check out, things I subscribe to and read), then I get on with my day. Don’t get me wrong, I still get enjoy all this stuff, but some of it is starting to feel a little bit tired and quite frankly, like a waste of time. My guess is that this is a combination of a few things. First, I’ve really narrowed my focus and find massive fulfillment in implementing. I’ve also stepped up my engagement online: more conversations (phone or skype, not just online), more connections, my Facebook group, etc. When you start asking yourself if your actions are getting you closer to what you want or further away (i.e, what are you doing to make the sale? ), it’s time to reevaluate. Mind you, we all need some playtime in our days. This is not about every second of every minute being productive. It’s about how you feel when you do what you’re doing. I was having a conversation with my friend Davinder yesterday about the announcement by Nick Davis that he was ending his weekly Genesis newsletter. You guys know I was a huge proponent of Genesis and StudioPress, and while I still use the themes, it’s become tired. Something about Genesis and Copyblogger feels like they gave up. They stopped innovating. For lack of a better description, it feels like a stodgy corporation. Things move quickly online. By the time you feel like you’ve mastered something you’re supposed to be doing something else (or at least it feels like that, right?). Stick with what you know but try new things. Be willing to be open, share what you’re doing, and NOT do something simply because it’s what everyone else is doing. This is why I’ve been stuck trying to figure out what to do for my personal site. As much as I love graphics and WordPress, it’s not the best use of my time to keep trying to make something work. I need to focus on my strengths. Which is what I wanted to share with you today. I found something I LOVE and is a great starting point for my site (I’ll probably hire some help to get it finished, but at least I know I’m on the right track). I’m still using Genesis and Beaver Builder, but none of the Beaver Builder templates were doing anything for me (from 3rd party plugins as well). 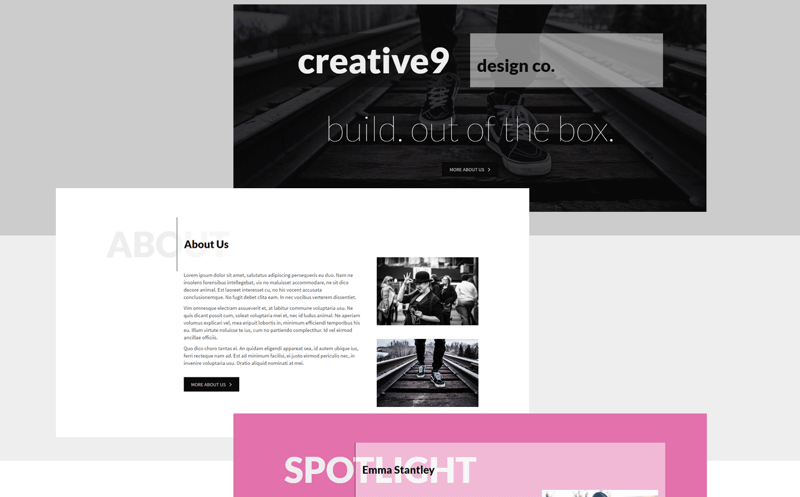 Then I found Creative9 by my friend Davinder. Best twenty bucks I’ve spent in a long time. O.K., now I’ve got to get the shammie off my head and get more coffee! Be sure to join me today at 12pm on my Facebook page as well, I’m going live with Dr. AD Finch. We connected through another live stream, I thought she was awesome and now I want to hang out with her to talk about how she’s using live streaming in her business.